It's personal. It's all about our passion for preserving a life's work. For the bird, the friends, the family, and the man behind them. Due to a limited amount of caring people, poor hatchery quality birds, and disease; the creation of a bird from current stock of commercial flocks would seem insurmountable in today's world. With the industry pushing for fatter faster, quick easy money, and no thought for consequence. That is surely what drove this bird into extinction. The final stages of completing this stunning part of North American history are almost here. It has been reported that less than 20 birds remain on the planet. A small town farmer in the Midwest named Steve Gerdes set down the path over two decades ago on an almost unachievable task of the recreation of an extinct bird. Some faint whispers would tell you that Mr. Lamons original bird is still alive hidden in caves along the east coast, those faint whispers also echo sounds of a Bigfoot in the woods. Through two decades of persistence by a small town Midwest enthusiast, this bird lives on in limited numbers only to be protected by a few anonymous sources and family of Mr. Gerdes. Steve retired from the laborers union; he farmed the Toluca area for longer than most. 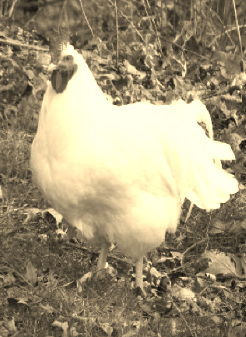 He had a lifelong interest in exhibition poultry and belonged to numerous poultry organizations. He enjoyed hunting, trapping, gardening and canning. His biggest enjoyment in life was his family. Sadly, Steve passed away in November 2012 only steps away from finishing a lifetime of breeding the Lamona to ultimate perfection. In his passing, most of the information is gone; there are no notes or scientific charts. Just the secrets shared with a few. Only a couple know the formula and only one has the true ingredients for finishing this bird. Our flock is a world away, seeking refuge from the prying eyes of mankind. Living a normal life, doing what chickens do best. Unbeknownst to them that they aren't just any class of poultry, and that's the way we like it. We are fortunate to be the proud few carrying the torch in this legacy and are thankful for the people that have helped us along as we continue this adventure. The Lamona possesses all the traits of a dual purpose bird. A long body of angelic white feathers, calm demeanor, and the ability to lay eggs like a B-2 bomber even in the coldest of climates, all year long. The eggs are off-white and at times have the tendency to be speckled due to the nature of the final steps in the breeding process. We are proud to be assisting Mr. Scott with the task of preservation for future generations. He is a very knowledgeable breeder with over 35 years' experience and numerous ribbons. His perfectionism to the APA standards has us (and a 98% completed bird) sitting on eggs for now. This is for the families that had the Lamona and want them again. To renew fond memories of lost youth. To preserve for their children's children. Refining the egg colour will continue prior to the 2014 release of very limited quantity to the lucky few in Canada and the United States. *This page was first published in Spring 2013. Write up by the farmer, Matthew Nelson and it is the property of the Nelson family. Images by others.